Stay organized and improve efficiency with legal case management software for your law practice or legal department. 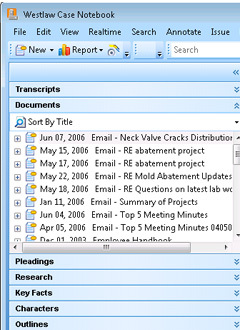 Case Notebook legal case management software helps you organize, analyze, and collaborate on even the most complex cases. Enter and share all your key case information, and – with Case Timeline – create top-quality timelines of case events. Concourse matter management software helps your legal department manage risk, increase visibility, and work seamlessly with outside counsel. 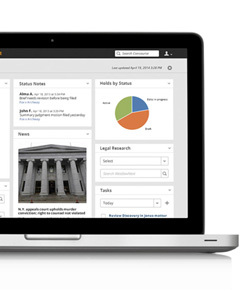 Designed specifically for governmental legal departments and corporate counsel. 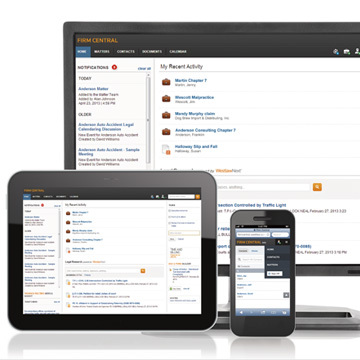 The cloud-based law practice management software designed for the way you practice. eDiscovery Point is a revolutionary new ediscovery software solution that puts the user in control with speed, accuracy, ease of use, and reliability. Track time and expenses easily, bill quickly, and get paid faster with the time & billing software designed for small law firms. Deadline Assistant calculates court dates and deadlines for specific litigation events based on the rules governing your case. It is available as a stand-alone product or integrated with Firm Central for solo and small law attorneys. Legal Tracker's e-billing and matter management system helps your legal department respond to increasing demands on time and budget. Quickly and efficiently obtain the facts you need to monitor ongoing or potential legal disputes and successfully litigate your cases. Jury Verdicts on Westlaw provides a uniform presentation of facts, including type of case, type of liability, a list of attorneys and experts involved, case analysis of the facts, and an award breakdown. With one report, Case Evaluator lets you evaluate cases, review court documents, investigate experts, and more. Keep your courts moving with the comprehensive and configurable court management system from Thomson Reuters Court Management Solutions. Discover how today’s competitive law firms manage day-to-day activities, including clients, matters, workloads, tasks, and critical dates, as well as all related documents, reference materials, and reports. ProLaw provides client and matter management, as well as time entry, billing, and accounting capabilities in an integrated solution for streamlined workflow and improved efficiency.